Picked this up in Westborough Mass at Julio's. 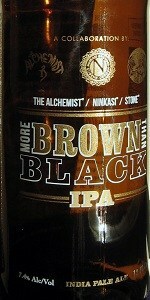 Caught my eye when I saw Stone and Alchemist collaborating. The excitement turned out to be warranted, because this was an excellent beer. It makes me want to try Heady Topper even more so than I already do. Right when I opened it the first wiff was a great strong smell of piney hops. Outstanding smell. The freshness was still there. Nice fresh feel and taste. A good balance of a fruit (grapefruit?) as well as that hops that I smelled.